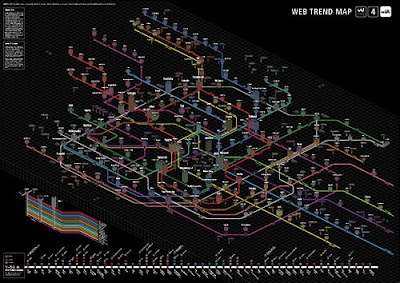 This is a thumbnail of the latest version of the Web Trend Map 4, from Information Architects, JP. The image, is one of the seminal web mapping tools, which looks to track both sites, influencers, and tools that define the emerging web ecology of participation - one upon a time known as web 2.0. These days - I for one prefer the social-semantic web - and the idea of web presence - i.e. a myriad of participation points where content - tools and people interact within a community of shared social or professional practice. How this will morph and change over the next few years is, of course, open to lots of debate. However, if the last couple of years is anything to go by, many of the tools and frameworks which will drive this change of focus won't come from inside the big closed institutions, whether commercial or cultural. Rather, much of it will emerge as a result of ideas being given the space to breath and develop inside new tools and collaboration frameworks. This image helps illustrate this trend - not because the people on the map are in charge - or more important than others - but because the best part of each of them including the big guys - recognise that their own sources are increasingly dependent on how the others on the grid develop and prosper. The writers to the map are looking for other names to include on the map. You might have your own ideas. I think Read Write Web should be on there. I have told them this - suggest you might want to agree? Hayek explained later.Designer handbags“And to have work, you needed volume, and volume was only achievable with watches like Swatch.”Once he had stabilized the Replica Rolex Watches industry, Hayek turned his attention to his prestige brands. Watchmakers were born, lived, and died in the Vallee de Joux where most of the prestige names –Replica Rolex watches ,Watches Replica – where headquartered and there was a “Vallee mentality,” UK Replica watches as Hayek saw it.